The tables are turned on Mr Bennet when he finds himself obliged to play Cupid for a young friend, a task that takes him from Meryton to London and Bath, but also into a past he would prefer to forget. 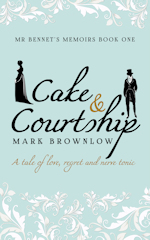 Set against the backdrop of the first half of Pride and Prejudice, Cake and Courtship is full of Regency wit with a dash of romance. A sequel is due in 2019. 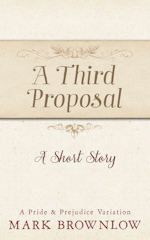 And if you like Mr Bennet's style, he also stars in a short story - A Third Proposal. See Hunsford and Rosings come to life in a series of gentle novellas starring Charlotte Collins. She’s clever, practical and caring, which is fortunate for the de Bourghs, their guests, Mr Collins, and all the other Hunsford villagers. 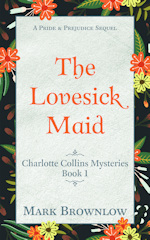 In The Lovesick Maid, a servant falls ill, but is it just a case of a broken heart? Only Charlotte has enough wits about her to find out. 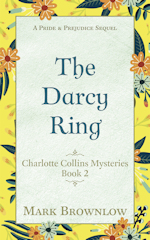 In The Darcy Ring, Charlotte is reunited with Mr and Mrs Darcy. A theft threatens to overshadow the occasion, but is there more to the incident than meets the eye? Charlotte certainly thinks so.